Above you see one of our stunning Doctor's and the Medical Staff Team Leader cutting (no pun intended even though she is a Surgeon) loose doing the Macarana at the Victory Dance. Notice the famous "Trashman Joe" taking in the event to the right!! SOMI's Medical Staff provides complete medical coverage during the games for the 3,500 plus Athletes and their Coaches, Chaperones, and Spectators. Our Multi-Disciplinary Staff is composed of the traditional titles one would expect a Medical Staff to have (Doctors and Nurses). We also believe that since most care for injuries occur at the venue or away from our treatment center that it is a Pre-Hospital environment, so we add Paramedics, EMT's, and MFR's to the pot. 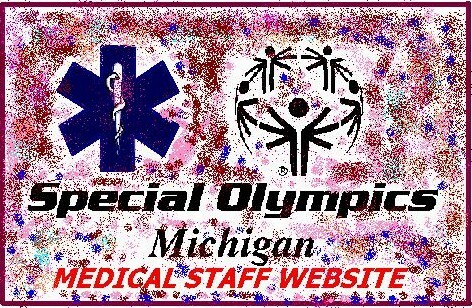 One thing that sets Michigan aside as having one of the Finest Medical Staff's in Special Olympic's, is that we relize this is an Athletic Competition and have incorporated Athletic Trainers, and other Sports Medicine professionals into our staff to provide the best care possible for the Athletes! That's no Athlete! 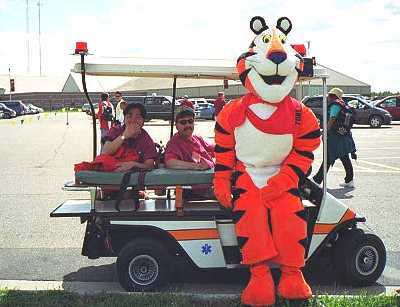 It's Tony the Tiger and he stopped by to take a rest on MEDIC-1 with Yoshi and Bill from the Med Staff at Outdoor Special Events. Thanks for being part of the games Tony - they're GREAT! That is a cool little golf cart, gas powered and a complete BLS unit complete with Head Lights, Revolving and Strobe Warning Lights, and a Siren. Haven't had to use it at the games but our thanks to Medic-1 for letting us borrow it just in case. CMU, Spartan Stores, and other volunteer agencies such as the 144th Military Police (Army National Guard) out of Owosso, Michigan make the games happen for these athletes! 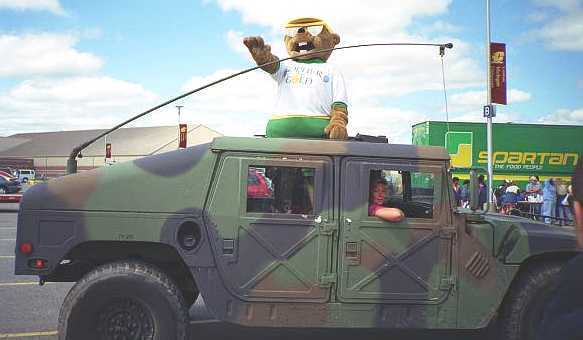 Here you see one of the Special Olympic's mascots "Gopher the Gold" arriving in a HMMWV (High Mobility Motorized Wheeled Vehicle) "Hummer" to share in the Athletes Festivities between competitons. If you look closely you might notice a Medical Staff member wearing a couple of hats here. This gal goes way out of her way - not only does she volunteer on the Medical Staff, but she also coordinates the entire Opening Ceremonies for the Summer Games. That is the type of dedication SOMI Volunteers are famous for! 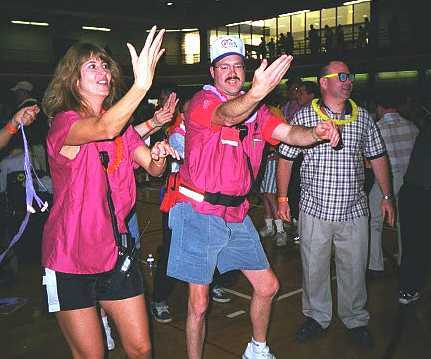 Or you can CLICK HERE to visit the Special Olympics - Michigan website to check event schedules and contact info. Looking for a new Credit Card? Show your pride in Special Olympics with this FirstUSA Visa honoring the Athletes. The only law here is that you have to do your best and have a lot of fun!! 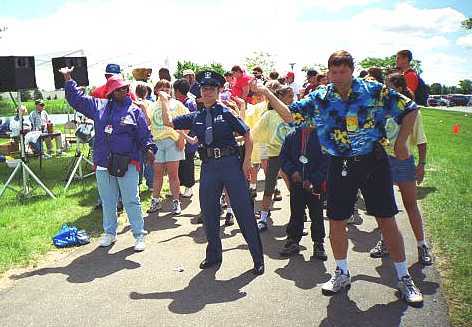 One of my fellow (sic) LAW ENFORCEMENT TORCH RUN for Special Olympics runners, a MICHIGAN STATE POLICE Trooper from the new Detroit Metro North Post (21 I think), takes a minute to show this group of Athletes the way to break out in dance!!! This Trooper is part of the State Police Team that runs the torch from Copper Harbor in the Upper Penninsula all the way to Detroit to raise funds for Special Olympic's. Also involved are members of the Michigan Sheriff's Association, Department of Corrections, and hundreds of Local Law Enforcement Officers from around the state. 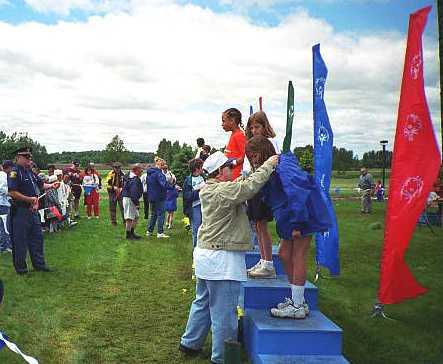 Here we find Actor Chris Burke, known for his role as "Corky" on the TV Show "Life Goes On" giving out awards to athletes at the Track and Field Events. Chris is the Honorary Chairman of Special Olympics - Michigan State Summer Games now for his 6th year. His accomplishments and enthusiasm is an inspiration to all at the games, Athletes and Volunteers. We are proud that he has become a regular part of the Summer Games here in Michigan. I consider it an honor and priveledge to work with Chris during the games. Do You Shop Online? PlanetRx, REI, Amazon.com...etc? Use the link to "Greater Good.com" and up to 15% of your the money you pay for purchases on line will go to Special Olympics. There are hundreds of stores: Dell Computers, Drugstore.com, MarthaStewart.com, The Gap, JC Penney, L.L. Bean, Office Max, Starbucks Coffee... the list goes on. Just MAKE SURE you register before shopping or else SOMI won't get the donation. Check it out !!!!! "Let me win, but if I can not win, let me be brave in the attempt!"